The Cosmonauts were trying to replace an older piece of technology. Russian Cosmonauts broke their country's spacewalk record Friday while installing an antenna on the International Space Station. The two Russians spent 8 hours and 13 minutes outside the station. The previous Russian record of 8 hours and 7 minutes was set in 2013. 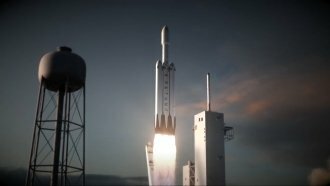 Related Story Guess How Many Engines SpaceX's Giant Falcon Heavy Rocket Has? The cosmonauts were only supposed to be out there for 6 and a half hours, but the equipment they were replacing gave them some trouble. When they finally removed it, they tossed it into space. And after all that work, it turns out they deployed the replacement antenna in the wrong position. Luckily for the astronauts, the new equipment seems to be in working order.